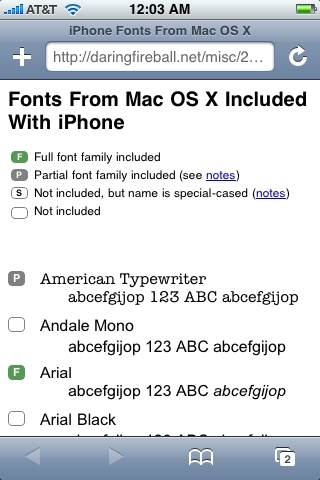 Back in July when I wrote about the fonts available in the iPhone OS, I speculated in a footnote that the iPhone was using sub-pixel anti-aliasing to render text. But it’s not that simple, even on Mac OS X. There are all sorts of spots where Mac OS X falls back on standard anti-aliasing, even on systems set to use sub-pixel rendering. Dashboard widgets, the new Leopard menu bar, and, apparently, just about all text rendered in Core Animation views.1 Sven-S. Porst has a nice report about this, and he concludes that sub-pixel anti-aliasing is, ultimately, a clever hack that will eventually fall by the wayside as display resolutions improve. I suspect he’s right. What makes text look so good on the iPhone compared to a Mac is simply the density of the pixels on its screen. 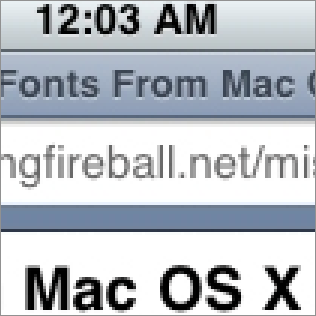 When you look at an iPhone screenshot rendered at full-size on a Mac, there’s nothing special about the text rendering. Current Cinema Displays offer roughly 100 pixels per inch, most MacBook screens are around 110-120, and the high-resolution 17-inch MacBook Pro offers 133. But the iPhone offers 160 ppi. That’s apparently the point where standard anti-aliasing — simpler and easier to compute and render — is sufficient to produce good-looking on-screen type.